A popular Highland bridge is out of use after Storm Desmond damaged its foundations. The Green Footbridge at the Pass of Killiecrankie in Perthshire has been closed by the National Trust for Scotland after an inspections by an expert. A diversion for walkers has been set up at the site. 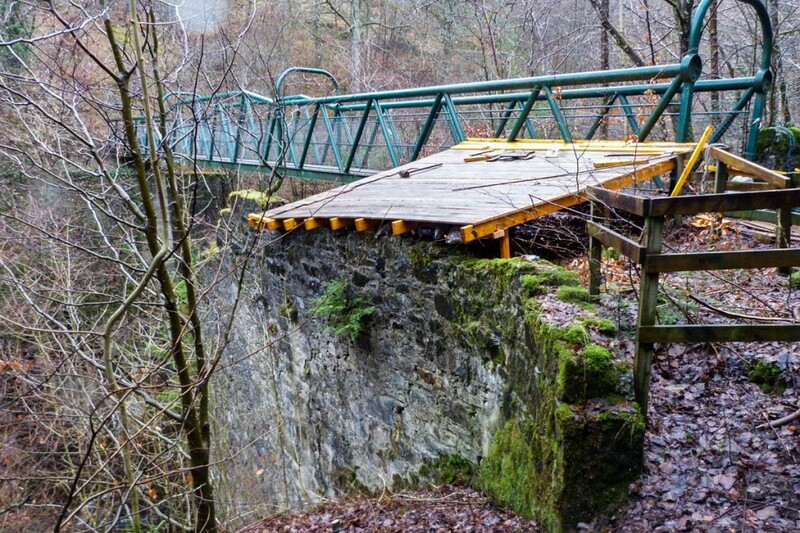 The trust’s North Perthshire property manager Ben Notley said: “Following the heavy rain during Storm Desmond early in the month, the National Trust for Scotland became concerned about the state of the remains of the 18th century bridge that used to cross the south end of the Pass of Killiecrankie. “While the bridge was largely demolished in the 1950s, its remains surround the foundations of the popular 1960s footbridge, known as the Green Footbridge that crosses the River Garry just upstream from the Garry Road Bridge. “A specialist consultant arranged for a detail inspection by a steeplejack. This revealed the old remains are in a perilous state with a real risk that any further heavy rain or hard frost would result in a major collapse, with unknown consequences for the foundations of the current footbridge. Consequently this has been closed until further notice. “The Green Footbridge is an integral part of the Pitlochry footpath network, particularly the Bealach and Killiecrankie walks around Loch Faskally. “A diversion is in place using a bridge over the railway line and then the Garry Road Bridge. For those walking the Pass of Killiecrankie it is recommended that the roadside footpath is used because Storm Desmond also dislodged the wooden sleeper bridge that crosses the Troopers Den burn at the north end of the Pass.